If your fleet uses diesel exhaust fluid, don’t miss our live webinar next Wednesday. DEF 2018: How to lower costs and right-size storage shares some of the major trends we’ve seen impacting DEF markets this year. DEF can yield great benefits for fleets – lower emissions and improved engine efficiency. Some fleets, however, are not realizing these benefits because they’re not monitoring DEF quality, tank size, or SCR-unit performance. Join the webinar to learn how to get the most out of DEF engines, while reducing costs and improving performance. Oil markets continued rising yesterday, joining other commodities and equities as fears over a strong dollar die off (for now). 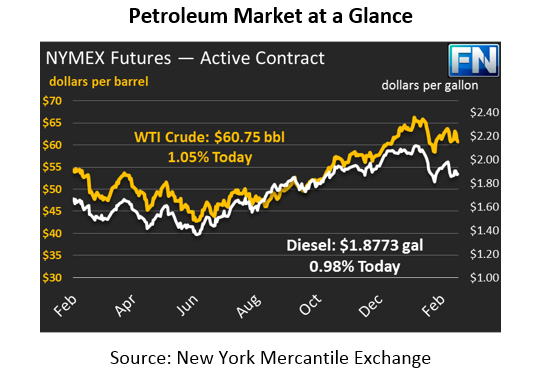 Oil prices gained 63 cents yesterday, or roughly 1%, and closed above $61/bbl. Today, crude prices are down slightly but remain above $61, with prices down 22 cents to trade at $61.12. Fuel prices also moved higher yesterday, with diesel posting modest gains while gasoline prices rose 2.3 cents. Diesel prices have managed to hold onto its gains, up 0.4 cents today and trading at $1.8960. On the other hand, gasoline prices are $1.7326, 0.3 cents below yesterday’s closing price. For the past week, 3:2:1 crack spreads (a refiner’s rough margin from blending three barrels of crude into two barrels of gasoline and one barrel of diesel) have trended well below their recent levels. Spreads this week averaged around $13.70, well below recent levels of $17-$20. Narrowing spreads indicate there’s less demand for refined fuels, leading refineries to produce less fuel this time of year. Oil markets (as well as other commodities and equities) have been significantly impacted this week by speculative activity in the market related to interest rates. While strong economic growth increases oil demand (and therefore prices), it also leads to Fed to pump the breaks by raising interest rates. The Federal Reserve set in motions plans to reduce its balance sheet, functionally tightening credit and taking away dollar that would have flowed to financial markets. Less money in the market means less dollars to buy crude oil, reducing demand for financial contracts and sending prices lower. This impact applies only at the financial level – there’s no real change in supply/demand fundamentals of physical oil.